Murray, a 2008 Lander University graduate, spent four seasons with the Furman softball program after a standout career as a pitcher for the Bearcats. The Boiling Springs, S.C., native garnered 2007 and 2008 Peach Belt Conference Academic Honor Roll accolades and finished fourth in Lander’s career strikeouts records and fifth with nine shutouts. A 4A All-State selection as a prep standout at Boiling Springs High School, Murray has guided the Paladin pitching staff to a top three ERA in the Southern Conference in two of her first three years with the program while also producing one all-league selection and one SoCon All-Freshman pick. It was like a breath of fresh air! I met Denny a few years ago when I went with one of my students to see what Fluid Dynamics was all about. I was coaching collegiately at the time and I was always looking at other opinions to benefit my pitchers. After all, pitching is evolving just as hitting has over the years, so why would you not look to learn from others’ ideas? I was taught the old school way with many of my mechanic’s but I had evolved into many of the teachings that Fluid Dynamics stands for. So it was awesome to hear how Denny could explain all the reasons behind what he was teaching. Being involved in the sport for the time I have, you find so many pitching coaches that only teach what they have been taught but have no reasoning behind it. I believe Fluid Dynamics can definitely help pitchers reach their maximum potential and I would go as far as to say it helps prevent some common injuries pitchers have. I’m so excited to see the results that many pitchers are going to have when they embrace Fluid Dynamics! Here is what Denny says about Austin: She constantly challenges me and I love it. Austin and I sometimes come at a problem from different directions, yet after a little discussion we realize we have exactly the same goal in mind. 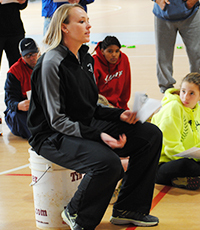 Her success on the mound, and as a D-1 coach, makes her invaluable for evaluating new concepts. She watches and listens very thoughtfully to make sure she likes a new idea and often proceeds to improve upon it. Pitchers love her and relate well to her.